Booking flight at last minute – While booking early doesn’t always mean the best deal, waiting until two weeks before your trip means paying the highest possible cost. Other than the savings, booking early allows you to have more flight schedule options. Once a flight is sold out (or overbooked) airlines take those schedules offline and the options no one wants like the 6am to Vegas and 5hr layover in St Louis are left. There are a few exceptions to this rule but general rule of thumb book anywhere from 45-60 days out. If you do find yourself in a last minute scenario Kayak.com and Hotwire.com will search across most airlines for the lowest fares. Not scoping hotel options – It’s so important to know what you are looking for in a hotel resort. Close to the city center? Fitness Center? On site massage services? When I travel complimentary wi –fi, onsite restaurant and fitness center are must have amenities for me. There is nothing worse than checking in to your hotel and finding out there’s no room service or dining options. Doritos and Coke from a vending machine don’t make a very fulfilling dinner! Depending on the nature of your trip (sightseeing, family or leisure) narrow down your “must haves” and compare at least 3-4 hotels before booking. You may be willing to sacrifice on site restaurant option if you know the hotel is close distance to several restaurant options. Know before you go! Staying in your comfort zone – One of my MAJOR pet peeves is people who travel and don’t experiment with the culture. I mean did we really come to London for you to order a cheeseburger at every meal?! Why bother coming to Miami Beach (key word being BEACH) if you are going to stay in the hotel the entire time! Makes no sense. You more than likely will not have a repeat visit to your destination so while there you want to be sure to soak up all the location has to offer in local cuisine, excursions, historic sites and shopping. Research beforehand and pick out a few recommend restaurants, sites and tours to add to your itinerary. Maximize your time and make some amazing memories! What are some of your travel lessons learned? I have no problem getting out of my comfort zone and trying new things once I'm actually on vacation. For me, the most difficult part is GETTING THERE! I'm a major procrastinator, and I'm so lazy (yes, I'll admit it) when it comes to comparison shopping and actually reading reviews. 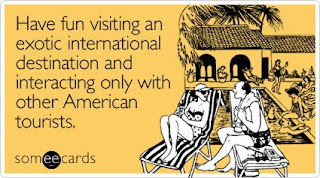 I wish vacationing was a simple as selecting a location then nodding and blinking!